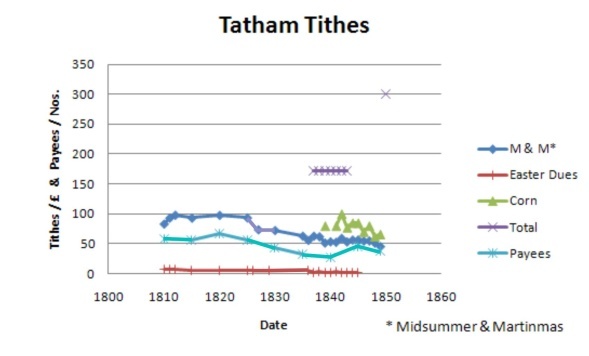 The history of tithes in the local area, in the first half of the 19th century, is described below mainly using Tatham as an example, because of the availability of early records. Records of Parish tithe payments exist in the Lancashire Record Office in the form of account books kept by George Smith,2-4 who was clerk to George Wright, steward of Hornby Castle Estate, as well as in the former's Diary for 1819-1856.5 Apart from the stallinges (see below), only one account is signed Geo(rge) Smith, but the handwriting is consistent throughout. They indicate that several different tithes were collected every year: (i) Midsummer & Martinmas tithes; (ii) Easter Dues; and (iii) Corn tithes, although these were not straightforwardly related to the categories given above. Easter Dues comprised small levies on a variety of produce. Many were a standard amount per houshold levied for convenience on proxy items rather than the products theselves, others were a small charge per item. (Click here for an example of the transcribed record for 1810). These are listed in account books for 1809-1830, in the Lancashire Record Office,3 and total Easter Dues for the next twenty years are often quoted at the end of the Midsummer and Martinmas tithe accounts. The individual levy rates can be worked out from the detailed accounts, together with the information on previous practices given in the Tithe Award of 1848,6 and records of the associated discussion meetings,7 e.g. Cows were differentiated as 1d per farrow cow (cow not in calf that year)6 and 2d per nuckled cow (newcal: calving that year).6 Hemp seems to have been widely grown in both divisions, at least between 1815-1829. The corn & hay tithe does not seem to have been levied after 1814 and this may be due to the existence of an agreement on a monetary payment, or modus, as claimed in the dicussion of the Tithe Award. Such a modus was accepted for the Higher Division (High End) with a value of £1 1s 4½d, as well as an individual modus for Robert Hall of £1 11s 6d. Interestingly, the total for corn & hay in the High End in 1810 was £1 7s 11d, indicating what the modus represented. The Easter dues also included two church dues: a charge per ‘communicant’ – a variable charge per household, possibly 1d per adult and ½d per younger person – and a fixed ‘oblation’ charge of 1d per houshold. In some cases these were the only payments made. However, no payment was made by paupers or by others who were presumably exempt on religious grounds, including Quakers and the Catholic families of Robert Hall and Clintsfield. Finally, the Lord’s Rent was paid by some individuals: 3/3d by Rev’d George Holden of Horton (?) and William Burrows of Guy Hill, 5/- for Hunter’s land. Although particular days were set at the beginning of the year for payment of both groups of tithes together, the Diary shows that indivduals could pay them at any time during the year, and even years after,5 e.g. March 29th 1819 John Thistlewood of Croasdale Grains, Tatham called respecting his Tithes of Wool Lamb & Calf & Easter Dues due from him as tenant of an estate there belonging to Joseph Ellershaw in the years 1813, 1814, 1815, 1816, 1817, 1818. 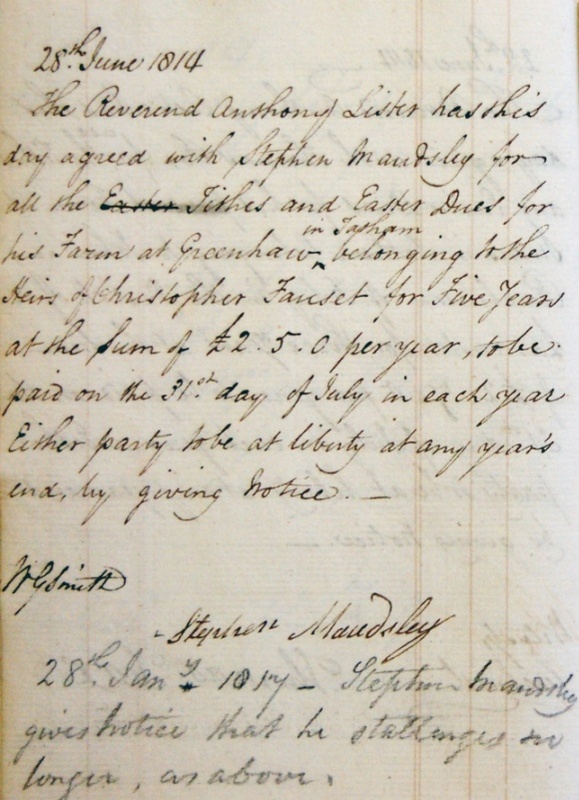 From at least 1811, there was an attempt at simpification by replacing both Midsummer & Martinmas tithes and Easter Dues with a single sum of money, agreed between an individual occupier and the Rector, lasting either for several years or open ended, and signed by both parties and witnessed by George Smith. (Click here for an example for Greenhaw (Green Hall) for 1814). Several were signed with a cross as late as 1834. The farmer is then said to stallinge for the sum of money (stallinge: dialect word meaning to compound for anything by the year or number).6 The agreements for 1814-1838 exist in a separate account book and these together with the tithe payments show stallinged sums increasing in frequency from one in 1811 to all but one in 1849.8 These sums were included in the Midsummer & Martinmas accounts and, consequently, the amounts of Easter Dues decreased proportionally. The general picture is of a locally adapted sytem of tithes comprising various levies on at least 16 entities. From 1810 to early 1820s the non-corn tithes were raising about £100 per year, about 5% from Easter Dues and 95% from Midsummer & Martinmas (see figure). Subsequently, the income from both declined considerably, mainly during the period 1826-1836, to an average £57 in 1840-1845. The drop in commodity values (fleeces & lambs) must have been a major factor in this but, interestingly, there was also a decrease in the numbers of people paying tithes, although this recovered somewhat (based only on five yearly figures as yet). The corn tithes, averaging £82 for 1839-1846, are likely to have been the second major component of the tithes throughout the whole period being discussed. The only figure for the total tithes are the estimate for the seven year average of £171, produced in 1844 for the discussions related to the Tithe Commutation Act.8 Whilst this could well have been appropriate for the early period, the sum of the three tithe components is only £139, i.e. an average shortfall of £32, for which the source is unknown. Regardless of its basis or validity, this total was about to be dramatically increased! The work engendered by the 1836 Act was carried out by appointed Commissioners who established, by local consultation, the previous tithe procedures and amounts for a parish. From this was determined the Rent Charge Award, the single sum to be paid annually to replace the tithes. This was then distributed by the Valuer between all the individual land holdings, i.e. every house or cottage and yard, field, wood, mill etc., according to their area and use. This was listed alphabetically by owner in the Tithe Apportionment document (Schedule) and, secondly, by occupier, giving plot name, use, acreage and rent charge. The individual rent charges were totalled for each occupier, and these again again totalled for each owner in a final Summary. Tithe owners were exempt from tithes, as were roads and rivers. The location of each of these numbered land holdings was shown on the Tithe Map. For Tatham Parish, the Assistant Commissioner was John Job Rawlinson, Barrister of Greythwaite, Lancashire, replaced later by Townsend, and the Valuer, who was more in evidence, was James Birrell of Gretna. Four meetings were held at Tatham Bridge Inn or Hornby Castle Inn, from Dec. 14th 1844 to Aug. 22nd 1848, between the Assistant Commissioner and interested local landowners and the rector, or their representatives including George Smith. Some detail of these negotiations are contained in the (incomplete) Tithe File of the Record Office and in Smith’s Diary. The average sum previously paid over the last seven years was put at £171 including 10s Highway Rate, with ⅔ coming from the lower division and two thirds from the upper. The average contribution to this from the corn tithe was £82 8s 7d.5 To this total was added £3 for unpaid tithes on coppice woods and £102 12s 7d for agistment (pasturage) and green crops. It was also proposed to add a tithe of 2 d/acre for lower division hay but this was resisted on the grounds that a previous modus covered this. This was partially accepted by the Commissioner and, after a further compromise by Smith on behalf of the Rector, £23 7s 5d was added for lower division hay, giving a final figure for the Rent Charge of £300.5,8 The award is given as a preamble to the Tithe Apportionment,7 i.e. Agreement on the Apportionment eventually followed on Sept 17th 1849. It included 1144 valued and numbered properties (some numbers supplemented with letters).7 In addition 12 properties belonging to tithe owners were exempted as well as all woods, commons, moors and fells, church and chapel. So too were roads and rivers. The basis for the individual property valuation by Birrell is not clear but seems to have included use, size and quality. For example,values in d/acre for a farm at Lowgill were: meadows 6.3 to 8.7; pasture 6.7 to 14.2; rough pasture 3.5; arable 9.5 and house and yard 12.1. Comparison of the list of occupiers given in the Apportionment with the 1841 and 1851 censuses indicates that the original data for Tatham Fells derives from the period between the censuses, whereas that for Lower Tatham clearly predates 1841 (15 cases with same occupier in both censuses but different in the tithe survey). The first payments under the new scheme were made in 1850. The actual tithe paid on each tithe area, defined by the par values in the Apportionment, varied each year in proportion to the corn price adjusted Rent Charge. The Tithe Map has a large scale (1:4733) but otherwise compares closely with the contemporary smaller scale Ordnance Survey map (1:10 560).9 Interestingly, George Smith assisted the OS surveyors in the production of that map, defining for them the parish boundaries in 1841 & 1842. The OS maps were published in December 1847 (Tatham) and 1848 (Tatham Fells) and they claim to have been surveyed in 1844-45. Despite this, the Tithe Commission meetings decided that a suitable OS map could not be supplied (perhaps because of the scale) and, after Smith obtained tenders, Mr Scully of Huddersfield was appointed to produce a new map, on Nov 17th 1847. The finished map, inscribed James Scully L (Land) Surveyor, was sent to the Tithe Office for approval on April 14th 1848, for which Scully was paid £73 6s 6d, divided between the Lord of the Manor (Pudsey Dawson) and the Rector (JM Wright). Since the OS map was in fact available, although at a reduced scale, it is tempting to think that it was used as a basis for the Tithe Map, by simple enlargement. Details could then be quickly checked and amended where necessary. Smith actually records his use of such a device, a pantograph (given as pentagraph), for enlarging estate plans in 1842 and 1845. Like the tithe map, the earliest version of this OS map does not show the NW Railway's Wennington-Lancaster branch, opened in 1849 (Smith's Diary), although it is present on a later version with the same publication date. Using the OS map in conjunction with Tithe Map allows the names of houses and farms to be identified. For Tatham parish only, the original tithe map and complete apportionment schedule are available on this website in an interactive format. Also available, for Tatham parish, and for each of the six townships which constitute Melling parish, are summary schedules and maps, the latter based on 1847-48 OS mapping. Click here for an index of the maps. Revaluation of tithes of the Townships in the old Parish of Melling was also completed by J J Rawlison in 1848, i.e. Melling with Wrayton ; Hornby; Farleton; Roeburndale; Wray with Botton; Wennington (Arkholme with Cawood not considered here). In these cases the awards were divided between the Vicar of Melling (Reverend J Tatham) and the improprietor Pudsey Dawson of Hornby Castle Estate and Lord of the Manor. A table of the Tithe Awards (below) shows that the Vicar of Melling received only 7 % of them. In practice, considerably less because the Impropriate sum for Hornby is low since Pudsey Dawson occupied much of the land himself and also his tenants tithes were merged, presumably with the rent (46 % of Hornby township was owned by him). Interestingly, although Hornby Castle no longer owned land in Roeburndale (except for one smallholding), it still retained ownership of the impropriate tithes and the same is true to varying extents in the remaining townships. In contrast, the Reverend John Marsden Wright was the sole beneficiary of the Tatham Tithe Award. 1 National Archives Research Guide 41. 2 Tithe Collection Books, Midsummer & Michaelmas Tithes 1810-1834 & 1835-1849, Lancashire Record Office PR2920/3/3-6 & PR542. 3 Easter Dues 1809-1830, Lancashire Record Office PR2920/3/1-2. 4 Tithe & Easter Dues Agreements 1814-1846, Lancashire Record Office PR2920/3/8-9. 5 Diary of George Smith, Tatham 1819-1856, transcribed by Jennifer Holt (Privately held). 6 Wright J. 1904: The English Dialect Dictionary, London. 6 vols (EH pers. comm). 7 Tatham Tithe Apportionment, Lancashire Record Office. 8 Tatham Tithe File, National Archives, IR18/4277. 9 Tatham Tithe Map, Lancashire Record Office, DRB 1/183. Page created 1-3-2010. Latest update 25-07-2017.